Soon, very soon, God is going to reveal Himself to all mankind. You don't have to believe it. We're not trying to make you believe it. Our job is just to tell you about it. Because you're going to see it for yourself. We know that for an authoritative fact — because we've been commissioned to herald the GOOD NEWS of Christ's World-Ruling Government. You have come into contact with the very WORK OF GOD! 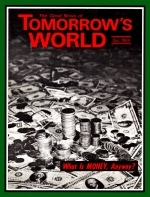 Many of you subscribers to TOMORROW'S WORLD have been personally selected by the Creator of Heaven and Earth to actively participate as Co-Workers in His End-Time Work. You have caught the vision. You have forged a position of mammoth responsibility for yourself. You have had the courage and the foresight to enthusiastically support God's Work with your tithes and offerings. You have become Co-Workers forever! That's not just a figure of speech. You are literally Co-Workers with Christ on God's Eternally Triumphant Team! Together, all of us are the instruments through which God is revealing Himself to this last generation of humanity. It is our job to give all nations God's warning witness (Matt. 24:14) before the Great Tribulation and the Day of the Lord strike. The world as a whole will reject us and hide from their God — just as they always have whenever God's messengers have spoken. That's all right. We are not trying to convince or convert anybody — even if we were, it wouldn't do any good. Our purpose is to give this world a witness that they'll never forget — so that when these prophecies do unfold in headlines and blare out of radios, when a conquering Jesus Christ returns to earth, the people "shall know that there hath been a prophet among them" (Ezek. 2:5; 33:33), and that the Lord God had indeed spoken through this WORK (Ezek. 24:24; 6-10). Humanity will come to know our WORK with the most intense worldwide emotion in history. They will see spectacular miracles (Matt. 10:7-8; Rev. 11:6) — and deeply realize that God is revealing Himself through us! They will hear our words — but in most cases they will not obey (Ezek. 33:31). One last time mankind will reject God's prophets and hide from its Creator. The phenomenally incomprehensible result of this development occurs at the resurrection — when, in truth and in fact, the person himself is changed into Eternal God! As wildly incredible as it surely sounds to our brainwashed ears, God Almighty is reproducing Himself. He is making man eligible for full-fledged Son-ship in His God-plane Family. That seems like sacrilegious blasphemy to worldly religions — but it happens to be the reason why God created the entire universe! Read our booklet, Why Were You Born?, for the full explanation. How do you know that God can reveal Himself through men? You can't stake your belief on these words stuck end to end. So prove it! Prove it by trying it! There is no other way. You must personally experience the enormous benefits of God's Spirit. And we don't mean some pseudosanctimonious hodge-podge of self-deluded emotion, nicey-nice prayer meetings and goody-good testimonials. We do mean God's breathtaking Purpose in life — and His specific office of scintillating authority prepared especially for you. You are a critical part of that Plan! God is offering you the opportunity to help in His Work. No exaggeration. You can share the joy of proclaiming God's worldwide witness today — and qualify to share God's joy, as a born member of His divine Family, when He comes to save the world! Let God put you on His team!